Since Buddy was gifted to the force, and handed over to PC Dave Chadwick at nine weeks old, life has been like that of any other puppy. 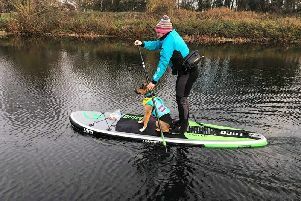 “We are teaching him the basics, but training won’t begin until he’s about 11 months old - then he will go off on a six-week course with the Leicestershire Police Dogs Section before becoming operational,” said PC Chadwick. Buddy is one of eight new specialist search dogs being trained to save officers vital time in tracking down evidence of criminal activity - including the rising problem of incidents involving electronic devices. Likely to be Spaniels and Labradors, these crime-busting canines will also be trained to sniff out firearms, drugs, explosives and cash. The pup was introduced to the public at a demonstration at the Lincolnshire Police dog section headquarters at Lincolnshire Showground, where old timers such as eight-year-old PD Archie also showed their skills. PD Archie is one of three specialist search dogs which are already trained and operational in the county. Money was hidden in a cylinder on a kichen unit and inside a pile of wood and PD Archie had a ball sniffing it out - quite literally. Police and Crime Commissioner Marc Jones explained why the investment was so welcome - with one specialist dog able to do the work of 10 officers in a search situation. He said: “The addition of this superb canine capability will help Lincolnshire Police to take the fighting of crime to those serious criminals who have no regard for the mayhem and misery they inflict on our communities. As a result of the support from residents for increasing council tax this year it has been possible to provide the Chief Constable with vital funding that he is putting to great effect to protect the people of Lincolnshire. Once the new search dogs are trained, they will be partnered with the force’s dog handlers who already possess a general purpose dog. These dogs are trained to search for suspects or missing people through tracking, and they can locate items that have been dropped or concealed during a police incident. They can also chase and detain violent suspects who run away when challenged to great effect. General purpose dog Orbit in action during a demonstration.